Some users probably still recall the old days when they like to stick post-it notes on their computer or table to remember important messages, tasks, telephone numbers, boss’s instructions, meeting dates, things to buy, etc. 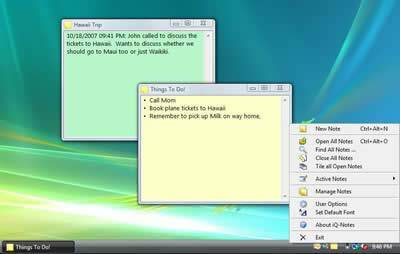 A computer or desk with notes sticking out of the screen is no longer necessary, however, with the introduction of the sticky note application. Users can type their important notes with the Sticky Notes application that comes in Windows for easy viewing and reference purposes. However, the Windows Sticky Notes application has a lot of limitations and is perhaps too simple for some users who need to do a bit more. iQ-Notes is an alternative solution for users who are looking for a more advanced and feature-rich sticky note program to jot down important notes instantly. This sticky note program offers users a simple text editor to do simple text editing such as bold text, add bullet points, etc. Besides text editing, users are given various configuration options to organize their notes. Users can go to the Note Properties to change the background color of the notes so that it is easier for users to categorize the notes posted on the screen. For instance, users can set green for office notes, yellow for personal notes, etc. Users can password protect their notes and set alarm to alert and notify users to remind them of specific notes. IQ-Notes is a free Windows application. Users can download iQ-Notes.exe setup installer for free. Once it is installed, users can double click the tiny application icon located in the system tray to start creating a new note. This application supports English, French, Italian, Spanish, Portuguese, and Dutch languages. Other attractive features available in this application include the backup, synchronization and export features. Users can make use of the automatic backup feature to back up the notes and restore them at any time. Users who have several computers can synchronize their notes jotted down in one computer with another computer conveniently. Users who want to send their notes over the internet are also given the option to encrypt the notes before transferring them to other computers securely.